Photo of the triumphal march of Marcus Vinicius from QUO VADIS. 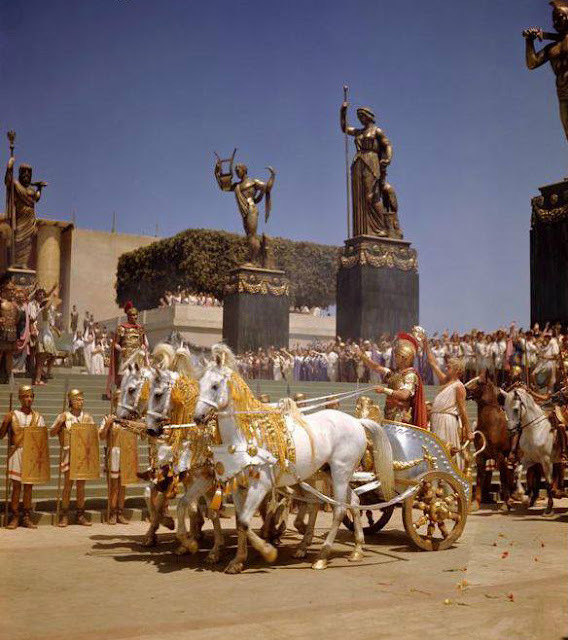 Taken from this angle, the photo shows how the production set in the background was to completed with a matte painting. This scene doesn't appear from this angle in the movie itself. Sophia Loren states in her recent autobiography that she was, at 16, one of the dancing slave girls throwing petals before Robert Taylor's triumphant march - its just one long shot - her first extra work. Of course a decade later she would be headlining her own epics: EL CID, THE FALL OF THE ROMAN EMPIRE.